Ninoy Aquino International Airport (MNL IATA), commonly called NAIA, is the airport serving Manila, the capital of the Philippines, and its surrounding metropolitan area. Located 8 km (5.0 mi) south of Manila in the cities of Pasay and Parañaque, it is the international gateway for most visitors entering the Philippines, and all major airlines in the Philippines have their main base of operations here. Ninoy Aquino International Airport started as (and remains) a military base. Built in the 1930s by the Americans as the military-only Nichols Field, it became Manila International Airport when civilian operations were moved here from Manila's former airport, Nielsen Field (which today is part of downtown Makati), in 1948. It was renamed in honor of Benigno "Ninoy" Aquino, Jr. in 1987, four years after he was assassinated on the airport's runway apron as he returned from self-imposed exile in the United States. Aquino was a leader of opposition to the Marcos regime, and his murder helped set off changes that led to his widow becoming President. NAIA is Southeast Asia's fifth-busiest airport, after the airports in Jakarta, Bangkok, Singapore and Kuala Lumpur. However, airport expansion has not caught up with passenger growth and the airport as a whole is set to reach capacity within the next 5-10 years: Terminals 1 and 2 are already operating beyond capacity, and intersecting runways make it difficult to increase capacity. As a result, the airport has developed an ominous reputation for poor infrastructure, long queues, delays, inefficient transit procedures and, more significantly, corruption. In 2011, two people were injured when part of the ceiling at Terminal 1 collapsed. Terminal 1 - world's worst airport terminal? Terminal 1 was judged the world's worst airport terminal by the "Sleeping in Airports" website (although some say the brouhaha over the terminal was a result of Filipinos overhyping everything), and passenger opinion of NAIA as a whole is poor, from Filipinos and foreigners. In August 2013, an on-line survey by a hotel booking company rated NAIA as the worst airport in Asia, below airports in Vientiane, Yangon and Phnom Penh and a very long way behind the best, Singapore. Things, however, are set to improve with significant government investment in NAIA. Terminal 1 is undergoing a ₱1 billion makeover to modernize facilities and to strengthen the building's structural integrity, while Terminals 2 and 3 will be expanded to support more flights. An elevated expressway has opened in 2016, easing travel between terminals and the rest of the metro, but a future connection to the Manila LRT Line 1 is expected to improve access to the airport for the long term. It is quite common for international travellers to bypass NAIA, instead entering the country via smaller and friendlier airports, mainly Clark for those whose final destination is in the north of the country and Cebu for those bound for the Visayas or Mindanao. NAIA has four terminals, Terminals 1-4. Terminal 2 is commonly called the "Centennial Terminal", as it was opened for the Philippine Centennial in 1998, while Terminal 4 used to be called the Domestic Terminal. The terminals are in separate buildings that are not connected. Air China, Air Niugini, Asiana Airlines, China Airlines, China Eastern Airlines, China Southern Airlines, Ethiopian Airlines, Etihad Airways, EVA Air, Gulf Air, Japan Airlines, Jeju Air, Jetstar Airways, Jetstar Asia Airways, Korean Air, Kuwait Airways, Malaysia Airlines, Oman Air, Philippine Airlines (flights to the Middle East, New York City, Toronto and Vancouver, and arrivals from Los Angeles and San Francisco), Royal Brunei Airlines, Saudia, Scoot, Thai Airways, XiamenAir. Philippine Airlines (all other international flights and flights to Bacolod, Davao, Iloilo, Laoag and Tagbilaran). NAIA charges a passenger service charge of ₱550 (₱200 for domestic flights), which since 2014 has been fully integrated into the cost of the ticket. Getting to NAIA from various parts of Metro Manila looks bewildering, but in fact it's relatively straightforward. It is 8 km (5.0 mi) southeast of Manila, and is well-integrated with Metro Manila's transportation system. Four types of buses connect NAIA to the rest of Metro Manila and beyond: point-to-point buses, UBE Express express buses, regular city buses and a minibus service. Metro Manila's growing network of point-to-point buses (P2P) now includes a direct connection between the airport and Clark International Airport in Angeles, Pampanga, primarily targeting transit passengers who need to connect to flights leaving from Metro Manila's other airport. Operated by Genesis Transport, the NAIA–Clark P2P bus departs from the arrival area of Terminal 3, stopping only at Ortigas Center (at the Robinsons Galleria shopping mall) before arriving in Clark. From Clark to NAIA, buses also drop off passengers at Terminals 1 and 2 before terminating at Terminal 3. Although the vast majority of P2P buses are operated using normal Genesis Transport buses, three daytime buses (at 9:00, 14:00 and 16:00 between NAIA and Clark, and at 10:30, 12:30 and 14:30 between Clark and NAIA) are operated by JoyBus, a luxury bus brand operated by Genesis Transport. JoyBus buses have a bus attendant on-board and are equipped with larger seats with in-seat entertainment, a restroom and other luxuries. P2P buses from NAIA to Clark run every 1-2 hours from 02:00 to 00:30, while buses from Clark to NAIA run from 01:30 to 23:00. A one-way ticket between NAIA and Ortigas is ₱300, while a ticket between NAIA and Clark is ₱350. In the opposite direction, a ticket between Clark and NAIA is ₱350-400 depending on the terminal. A JoyBus ticket costs ₱50 on top of the normal fare. Tickets are payable only in cash from points of departure. Travel time between NAIA and Clark is between 3 and 4 hours, and the bus schedule doesn't correspond with flight schedules at either airport, so make sure to board the bus as early as possible to avoid missing your flight. The UBE Express (which stands for "Ultimate Bus Experience") is an express bus service operated by the Department of Transportation in conjunction with the cargo provider Air21, connecting Terminals 1, 2 and 3 to various hotels and tourist attractions. All buses are air-conditioned, low-floor and equipped with Wi-Fi for the use of passengers. The Cubao, Ortigas, Alabang and Laguna routes are operated as P2P routes (similar to the NAIA-Clark bus), running from 05:30 to 21:00 with buses leaving every 1-2 hours. A one-way ticket is ₱70 to Ortigas, ₱100 to Cubao, ₱110 to Alabang and ₱190 to Laguna. All other UBE Express buses meanwhile run from 06:00 to 00:00, with buses leaving every 30 minutes. A one-way ticket is normally ₱300, although for the foreseeable future tickets are selling at half-price (₱150), and places may be reserved online. Terminals 1, 2 and 3 are also served by regular city buses. Terminals 1 and 2 are served by nine city bus routes, most of which run 24 hours a day (though with comparatively fewer buses late at night) and all of which serve points along Metro Manila's main road, Epifanio de los Santos Avenue (EDSA). These buses have a "MIA/Tambo/6-11" sign on the dashboard and the route description on the side. They are generally air-conditioned. Fares start at ₱12 (₱10 for students), and students may avail of a 20% discount on bus fares. Buses to Terminals 1 and 2 stop first at Terminal 2 then at Terminal 1. The Terminal 2 bus stop is beside the departures ramp, just after the entrance gate to the offices of the Manila International Airport Authority, while the Terminal 1 bus stop is just after the departures ramp, across from the short-term parking lot and the Greeters' Area. Buses between Terminals 1 and 2 are one-way; there are no buses which go from Terminal 1 to Terminal 2, only from Terminal 2 to Terminal 1. Terminal 3 is served by the Citylink bus operated by the Megaworld Corporation, which connects Resorts World Manila (across from Terminal 3) to Eastwood City in Quezon City via Fort Bonifacio using Circumferential Road 5 (C-5) during peak hours. Buses depart from Eastwood City every 30 minutes between 06:00-09:00 and 17:30-19:30, and the fare is ₱29. Terminal 4 is the only terminal not directly served by city buses. To get to Terminal 4, take any bus to Terminals 1 or 2, alight at the intersection of NAIA Road and Domestic Road (buses will stop at a footbridge just after the intersection), cross the footbridge to the other side of the intersection, and transfer to a jeepney. A minibus service, the Airport Loop service, connects Terminal 3 to MRT-3 Taft Avenue station, departing from the arrival area. Passengers are dropped off at Giselle's Bus Terminal, beside the station and also the staging point for long-distance buses by Genesis Transport to destinations in northern Luzon. A one-way fare is ₱20 and Beep cards may be used for payment. Three jeepney routes serve the airport complex. While slower, less comfortable and not air-conditioned, jeepneys are a cheaper alternative to buses, and also run 24 hours a day. Fares are ₱8 for the first 4 km (2.5 mi) (₱7 for students), with an additional ₱1 for every kilometer thereafter. Students are eligible for a 20% discount on jeepney fares, the same discount as for bus fares. The Nichols–Vito Cruz–EDSA–Tramo jeepney route, which serves all four terminals, stops at the intersection of EDSA and Taft Avenue (at the interchange between LRT-1 EDSA station and MRT-3 Taft Avenue station). The jeepney stop is just outside Giselle's Bus Terminal, beside the SOGO Hotel and the staircase leading up to MRT-3 Taft Avenue station. The Baclaran–MIA jeepney route serves Terminals 1, 2 and 4 and originates at Quirino Avenue, just outside the LRT-1 Baclaran station. Some of these jeepneys may ply the longer Domestic Airport–Baclaran–South Pier jeepney route, which connects the airport to Manila South Harbor and passes through a number of points in Manila proper. Jeepneys from Baclaran toward the airport stop first at Terminal 4 before stopping at Terminals 1 and 2. At Terminals 1 and 2, jeepneys stop at the designated bus stop, while at Terminal 4, the jeepneys stop in front of the terminal, either across from (outbound) or beside (inbound) the terminal. Similar to buses, jeepneys are only one-way between Terminals 1 and 2, stopping at Terminal 2 first before stopping at Terminal 1. The Terminal 3 jeepney stop is outside the airport beside the Circulo del Mundo Rotonda, although it is possible to get off at Resorts World Manila (on the other side of the road) and cross Andrews Avenue to Terminal 3. Because of the constricted space of jeepneys, it's not recommended to use them if you have bulky luggage. Two ways of getting to the airport: on foot from Nichols railway station, and by car using the Metro Manila Skyway and NAIA Expressway. The fastest way to or from the airport by road is through the elevated NAIA Expressway (NAIAx). 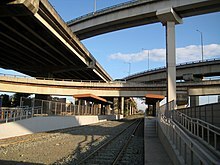 Connecting the airport complex to the Metro Manila Skyway (and the South Luzon Expressway), the Manila–Cavite Expressway and Macapagal Boulevard, it provides a quick, direct and traffic-free connection to many parts of Metro Manila and neighboring provinces, with exits for Terminals 1, 2 and 3. The NAIA Expressway has two connected segments. The short segment connects Macapagal Boulevard and the Manila–Cavite Expressway to Terminals 1 and 2, while the long segment connects the short segment to Terminal 3 and the Metro Manila Skyway. Tolls for driving on the short segment are ₱35, while driving on the long segment costs ₱45. On top of that, the Metro Manila Skyway also collected a toll of ₱20 on trips to or from the airport, but collection has been suspended while integration of the Skyway and NAIAx toll structures is ongoing. Surface roads also serve NAIA, all of which are named after the airport or prominent aviators. These include NAIA Road (formerly MIA Road) and Ninoy Aquino Avenue for Terminals 1 and 2, Andrews Avenue for Terminal 3, and Domestic Road for Terminal 4. Terminal 4 is accessible only through surface roads, with no connection to the NAIA Expressway. Although driving in Metro Manila is not for the faint-of-heart, with the opening of the expressway the surface roads are significantly less congested than before, and during times of light traffic (such as early morning) they can be a faster alternative. All four terminals have parking lots. Cars parking at Terminal 1 may park at Lots A and B, which have a combined capacity of 500 cars. While Lot C is largely occupied by the airport taxi fleet, there are slots available for paying patrons. Cars parking at Terminal 2 may park at Car Parks 1 and 2, which have a combined capacity of around 1,100 cars. Car Park 2 is partially occupied by the airport taxi fleet. Cars parking at Terminal 3 may park at the open car park, which has a capacity of 1,200 cars, or at the multilevel parking building beside the terminal, with a capacity of 2,000 cars. Cars parking at Terminal 4 may park at the open car park located on the other side of Domestic Road, which has a capacity of around 155 cars. Regular parking is ₱50 for the first 2 hours, while overnight parking is ₱300/day. Cars left at the airport overnight have to be registered with security personnel upon entry. For more information, the Manila International Airport Authority also operates a parking lot hotline at +63 2 877-1109, extension 4315. For many travellers, taxis are the easiest and most convenient way of reaching the airport. Official yellow airport taxis are available to bring passengers to and from the airport, charging a flagdown rate of ₱70 plus an additional ₱4-4.50 for every 250 m. Each departing taxi is registered by a dispatcher. These will cost up to ₱100-350 depending on your destination. Make sure to look up how far your destination is so you have a rough idea of how much you should be charged. Easily half of all taxis in Manila rip off foreigners every day. Always insist on using the meter and refuse to pay the posted fare if it's exorbitantly high. Regular white city taxis to or from the airport cost between ₱100-250 to most destinations within the city, depending on the distance. While city taxis are only allowed only to drop off passengers at the departures level of each terminal (or at a special drop-off only taxi rank in front of Terminal 4) and are barred from picking up anyone, arriving passengers on a penny-pinching budget may want to go up the elevator to the departure level from arrivals and flag down one that had just dropped off someone and are heading out. Since they don't pass on any airport-related fees, they are much more affordable. However, security guards are under orders to shoo away white taxis picking up passengers in the departure area. Always insist on using the meter. Special coupon taxis are taxis with fixed rates according to the destination. Coupon taxis serve hotels in Metro Manila, most points within the city, and towns and cities throughout Luzon. Some coupon taxi operators use minivans or SUVs, which may be useful for large groups. These fixed rate taxis can charge extortionist rates though, ₱1250 or higher to reach downtown Manila when a metered taxi would have cost ₱250. Finally, ride sharing services like Grab are no longer banned from the airport, and it is possible to request for one to pick you up. Depending on traffic conditions, they can be cheaper or more expensive than taxis. While not a practical way of reaching the airport, it is possible to get to the airport on foot. This is particularly true for walking from the Nichols railway station in Taguig, which is 2 km away from Terminal 3. PNR commuter trains run every 30 minutes during peak hours, and every hour at all other times, from 05:30-19:30. From Nichols station, head north on the East Service Road until the intersection with Sales Road at the end, then turn left. Walk straight until the intersection with Andrews Avenue at the end, and then enter Resorts World Manila. Resorts World Manila is physically connected to Terminal 3 via Runway Manila, an enclosed elevated walkway. If walking the entire way isn't an option, it is also possible to board a Nichols Ikot (Nichols Loop) jeepney towards Terminal 3 at the opposite side of the Sales Interchange, beside the Villamor Golf Course, and get off at Resorts World Manila. While it is possible to walk via Taft Avenue Extension, Quirino Avenue and then Airport Road, it is not recommended to walk from LRT-1 Baclaran station to Terminal 4 despite the distance (only 1.5 km). Use a jeepney instead. A taxi between Taft and the airport should be less than ₱100. NAIA is famous for being difficult to transit through, especially if the connecting flight leaves from a different terminal. However, free shuttle buses transport passengers between terminals. The buses run every 15 minutes, although adherence to the schedule tends to be spotty. Shuttle buses depart from the arrival area of all terminals, so make sure to have a visa (if required to enter or transit the Philippines) if connecting to a flight departing from another terminal. The terminals are in completely separate buildings that are not connected. If in a rush, take a taxi. Allocate at least three hours when transiting between terminals (especially if going to Terminal 3) in case of traffic congestion around airport roads. Passengers connecting between Philippine Airlines and PAL Express flights may avail of a free airside shuttle service between Terminals 1, 2 and 3. There is also a free airside shuttle service between Terminals 3 and 4 for passengers connecting between Cebu Pacific and Cebgo flights. It is also possible to walk from Terminal 1 to Terminal 2 (and vice-versa) via the International Cargo Terminal, using the same road used by public buses and jeepneys. Walking between the two terminals takes fifteen minutes, with a direct view of the apron around Gates 1 and 2 at Terminal 1. Terminal 3, the newest of the NAIA terminals. Unlike many of its Asian counterparts, NAIA has relatively few amenities or things to see. However, with the renovations at Terminal 1 and the opening of Terminal 3, this is starting to change. On the departures ramp of Terminal 1 is the assassination site memorial, a piece of tarmac removed from the terminal apron where he fell after being shot dead on his arrival at this airport from exile in the US in 1983. In the check-in hall of Terminal 3 is a bust of Benigno Aquino, Jr., made by sculptor Rosalio Arcilla, Jr. There is a viewing gallery at the departures level of Terminal 3, which overlooks the baggage claim area. Entrance is free. For children, Terminals 1, 3 and 4 have free NAIA Kiddie Traveler's Lounges at the pre-departure areas, complete with a play area, toys and games, a diaper (nappy) changing room and infant feeding station, and cartoons showing on TV. Terminal 3 has two lounges, each at the domestic and international pre-departure areas. The lounge is open daily 07:00-22:00 at Terminal 1 and 02:00-20:00 at Terminal 4. Children up to the age of 14 may use the lounge at Terminal 1, while children up to the age of 7 may use the lounge at Terminal 4. In the pre-departure areas, all four terminals have televisions installed which broadcast news in Terminals 1-3 and local television in Terminal 4. There are a number of VIP lounges at the airport for the use of business and first class passengers, as well as holders of certain credit cards. Compared to lounges at other Asian airports though, NAIA lounges are considered to be sub-par. Most of these lounges are in Terminal 1. Japan Airlines and Thai Airways International maintain their own lounges at Terminal 1, while Philippine Airlines maintains two Mabuhay Lounges at Terminal 2. At Terminal 3, Cathay Pacific and Singapore Airlines maintain their own lounges. Club Manila, 3/F, Terminal 1 (across from the old PAGSS Lounge), ☎ +63 2 877-1109 ext 3021. 24 hours. Newly-renovated in a streamlined Art Deco style, the lounge competes with the MIASCOR Lounge for the title of NAIA's best lounge. One of two pay lounges at Terminal 1, it has a Wi-Fi bar, a buffet spread and a shower. The lounge is also known for its large fish tank. Access is free to American Express Platinum and UnionBank Gold and Platinum cardholders, BPI "Preferred Banking" clients, BDO Diamond Rewards members, and business class passengers flying on Malaysia Airlines, Philippine Airlines and United Airlines. ₱750. Pacific Club Executive Lounge, 4/F, International Wing, Terminal 3. Daily, 04:00-22:00. The larger of the two lounges at Terminal 3, it has a modern ambiance with ample seating, a large buffet spread and a shower room. Access is free to Priority Pass, DragonPass, BPI SkyMiles Platinum, and Citibank Prestige and PlatinumMiles cardholders, SkyTeam Elite Plus members, and business class passengers flying on Delta Air Lines and KLM. $25. Skyview Lounge, 4/F, International Wing, Terminal 3 (near Gate 115). 24 hours. Formerly known as the MIASCOR Skyview Lounge, it is known for its tasteful decor and its delicious buffet spread, although the spread is not as plentiful as the MIASCOR Lounge at Terminal 1. While it is the smaller of the two pay lounges at Terminal 3, there's lots of seating and outlets, and it also has a shower. Access is free to Priority Pass, Priority Access Club, AmEx Platinum, Citibank Platinum and PremierMiles, Diners Club and UnionBank Platinum cardholders, holders of certain RCBC Bankard credit cards, BDO Diamond Rewards members, Globe Telecom Platinum subscribers, and business class passengers flying on ANA and Emirates. ₱800. Bo's Coffee. A local coffee chain known for its large selection of pastries, it has branches at Terminals 1 and 3. Goldilocks, North Wing, Terminal 2, ☎ +63 2 877-1109 (main airport switchboard then extension 2294). The airport store of the Philippines' largest bakery sells a variety of pastries, pies and sweets, including their famous ensaymada and mamon. Grand Kitchen, ☎ +63 2 879-5325. Serving traditional Filipino carinderia (traditional eatery) fare, it has branches at Terminals 2 and 3. Jollibee. The Philippines' largest fast food restaurant has branches at Terminals 1, 2 and 3. Serves typical American fast food fare, but with a Filipino twist. ₱40-200. Kaishu Express, International Wing, Terminal 3, ☎ +63 2 701-9326. This restaurant is a sister to Kaishu, said to be one of Manila's best Japanese restaurants. ₱180-300. Le Bistro, ☎ +63 2 836-9757. Known for its entirely locally-sourced sustainable coffee and organic salads and sandwiches, it has branches at Terminals 2 and 3. ₱100-300. Little Vin-Vin's, ☎ +63 2 877-1109 (main airport switchboard then extension 2439). This restaurant serves food in the style of the local carinderias, with branches at Terminals 2 and 4. It is the only restaurant in Terminal 4. Food here, however, is severely overpriced relative to what is being served. ₱60-200. Raku Hokkaido Ramen House, 4/F, Terminal 3, ☎ +63 2 721-9695. A decent Japanese restaurant in Terminal 3 best known for their gyudon and, of course, their Hokkaido ramen. One of the more popular restaurants in Terminal 3, it is often full. ₱120-300. Seattle's Best Coffee. Starbucks' sister chain has branches at Terminals 3 and 4. Unlike other dining options at NAIA, prices here are the same as in other Seattle's Best Coffee branches outside the airport. Starbucks Coffee, Head Transit Lounge, Terminal 1. The Philippines' largest coffee chain is one of the newest offerings at Terminal 1, serving their famous coffee and cold drinks, as well as other coffee shop fare. Ya Kun Kaya Toast, South Wing, Terminal 2 (beside Little Vin-Vin's), ☎ +63 2 401-4037. Singapore's most famous café has one of its four branches in the Philippines at the airport, where it serves both its famous kaya toast and a number of traditional Singaporean dishes. A major drawback to eating in NAIA is that none of the restaurants in the airport is certified Halal (nor kosher), and dining facilities for Muslim travelers in general are rather limited. Terminals 1, 2 and 3 have outlets of Duty Free Philippines (DFP), the Philippines' state-owned duty free retailer. DFP outlets are found at both the pre-departure and arrival levels of each terminal, and Terminal 1 has a DFP outlet in the Greeters' Area. The duty free stores only have full-sized bottles of foreign alcohol. However, if you just want a smaller flask or airline sized bottle, most of the shops and even some restaurants in the airport sell those. Christian Ventures Bookstore. This bookstore, which has stores at Terminals 1, 2 and 4, sells novels, travel guides, maps and periodicals in addition to Christian literature. Cora Jacobs, West Transit Lounge, Terminal 1, ☎ +63 2 833-3680. Known as the "pioneer of Philippine handbag design", its airport store has a variety of items from its collection on sale. National Book Store, ☎ +63 2 799-8140. The Philippines' largest bookstore has two stores in Terminal 3: one each at the International and Domestic Wings. It has a good selection of books and periodicals, and has a nominal school supplies section. Mixed Lifestyle, Domestic Wing, Terminal 3, ☎ +63 2 846-2383. A trendy clothing store in Terminal 3, it carries Team Manila merchandise, which make good souvenirs. Preclaro's Souvenirs, East Satellite, Terminal 1 (underneath the escalator going down to the gate area), ☎ +63 2 877-1109 (main airport switchboard then extension 4331). This souvenir shop has a variety of Filipino souvenirs, but it is better known for the giant, purple morion (a localized Roman soldier found in Marinduque) statue standing outside the entrance. Tesoro's Philippine Handicrafts. A famous retailer of Filipino handicrafts and souvenirs, it has stores at Terminals 1 and 3. While most stores at the airport (except at the domestic wings of Terminals 2 and 3, and at Terminal 4) accept pesos and US dollars, many stores do not accept credit cards. There are ATMs at all four terminals, but all are located prior to entering the pre-departure area. If you are leaving the airport into the outdoor area, beware of touts, taxi drivers that are paid commission to pick up passengers and charge you with a fare that is twice as the one in the meter. Better insist on taking the taxis waiting at lines outside, arrange transportation before leaving, or take other public transport, such as airport buses. The airport has its history of widely-reported scams, most notably the bullet-planting (tanim-bala) scam, which also called international attention as an American citizen became entangled in that scam. The scam has since subsided, but most passengers remain vigilant, so they wrap their luggage upon entry to avoid possible trouble. Another new scam uses a fabricated accusation, where corrupt immigration officers will tell you that you have a hold departure order and you will be held by security. There is no clear way to report this scam yet, but it is best to advise your local embassy if you get detained falsely. All four terminals have free, unlimited Wi-Fi access on the GlobeFreeWiFi@NAIA network, provided by Globe Telecom, although coverage can be spotty at times. There are standalone computer terminals at Terminals 1 and 2 with access to the Internet, as well as laptop desks at Terminal 2 beside the computer terminals. Two of the NAIA terminals have post offices. At Terminal 1, the post office is located on the west wing of the arrivals lobby, while at Terminal 2, the post office is located beside the Pass Control Office in the arrivals level of the South Wing. Both post offices are open on weekdays from 08:00-17:00. Mailboxes are located at the West Transit Lounge (after immigration) at Terminal 1, and at the post office in Terminal 2. Mail is picked up at 10:30 daily on weekdays. These stores are also authorized to bring mail to the post office for delivery. During weekends, these stores will hold mail until the post office reopens on Monday. At Terminal 1, this service is provided by the Christian Ventures bookstore at the East Satellite (gates 2-7). All departing passengers need to be aware that, especially at busy periods, there are long queues just to enter each terminal - so allow an extra hour or two just for this procedure. With the notable exception of Terminal 3, only departing passengers with proof of a departing flight are allowed entry, so you will need to make your goodbyes outside the terminal building in the heat, dust and general kerfuffle. Our Lady of the Airways Parish, Chapel Rd cnr Ninoy Aquino Avenue, Parañaque (At NAIA Road, turn right before the intersection with Ninoy Aquino Avenue), ☎ +63 2 851-4371. This is the official airport church and NAIA is probably the only airport in the country, if not the world, with one. A large statue of the Virgin Mary stands on an island across from the church, at the corner of NAIA Road and Ninoy Aquino Avenue. Shrine of Saint Thérèse of the Child Jesus, Newport Boulevard, Newport City, Pasay (Opposite Terminal 3, behind the Total gas station), ☎ +63 2 853-9187. The church of Newport City and the seat of the Military Ordinariate of the Philippines, it is a popular venue for weddings. Its dome is visible from all parts of the airport complex. Terminals 2 and 3 have left luggage facilities. At Terminal 2, this service is provided by Philippine Airlines (₱150/piece), while at Terminal 3, this service is provided by Luggage&More (₱150-200/piece for three hours, ₱300-350/piece per day). While not a left luggage facility as such, bags may also be left at the Interline Baggage Section of Terminal 1, located to the side of the baggage claim area (₱150-200/piece). All airport buildings, with a few exceptions, are no smoking areas, as is much of the outdoor space around them. Desperate smokers can go outside, but you may have to cross a road to reach an area where smoking is allowed. There are no free smoking lounges but some of the terminal restaurants have areas where customers may smoke. ground side: Let's Chow in the 4th floor food court (toward the bridge to the hotel) has a smoking lounge, and decent food and prices. air side: places near gates 119 and 134. While Terminal 3 has a lounge that provides sleeping facilities, Terminal 1 is also fitted with day rooms (₱840 per 24 hours) for the use of passengers with long connections, located at the arrivals level beside Gate 16. Each room has a bed and a small table, although bathrooms are shared. Go to the Transfer Desk to reserve and pay for a day room. Belmont Hotel Manila, Newport Boulevard, Newport City, Pasay (Opposite Terminal 3, between Runway Manila and the Shrine of Saint Thérèse of the Child Jesus), ☎ +63 2 318-8888, e-mail: info.manila@thebelmonthotels.com. Check-in: 15:00, check-out: 12:00. One of two mid-range options among the four hotels in Newport City, it has standard rooms, deluxe rooms and suites. No free breakfast. ₱6000. Holiday Inn Express Manila Newport City, 1 Jasmine Drive, Newport City, Pasay (Opposite Terminal 3, across from Resorts World Manila), ☎ +63 2 908-8600, e-mail: info.hiexmanila.nc@rwmanila.com. Check-in: 14:00, check-out: 12:00. Formerly called the Remington Hotel, it is the largest and cheapest of the four hotels in Newport City, equipped with standard and deluxe rooms. No free breakfast. ₱3200. Manila Airport Hotel, 99 PAL Drive, Airplane Village, Brgy. Vitalez, Parañaque (Across from the Terminal 1 parking lot, beside KFC), ☎ +63 2 854-7549, +63 2 854-7550. The closest hotel to Terminals 1 and 2, it has regular rooms, and cottages around a pool. Free breakfast. ₱2800. Marriott Hotel Manila, 10 Newport Boulevard, Newport City, Pasay (Opposite Terminal 3, beside Maxims Hotel and Resorts World Manila), ☎ +63 2 988-9999. Check-in: 15:00, check-out: 12:00. The Philippines' first Marriott Hotel, it is one of two mid-range options for hotels in Newport City. Rooms have a panoramic view of either the airport or the Villamor Golf Course, and the hotel has its own casino. No free breakfast. ₱7000. Maxims Hotel, 12 Newport Boulevard, Newport City, Pasay (Opposite Terminal 3, between Marriott Hotel Manila and Resorts World Manila), ☎ +63 2 908-8600, e-mail: reservations@rwmanila.com. Check-in: 14:00, check-out: 12:00. The most expensive hotel in Newport City and the first six-star hotel in the Philippines with 171 all-suite rooms which are all equipped with kitchens, bar facilities and a massage room, as well as individual in-room Wi-Fi and a personal butler. Unlike the Marriott, Belmont and Holiday Inn, there is free breakfast. ₱14800. Roger's Place Hotel, B3, Salem International Complex, Domestic Rd, Pasay (Opposite Terminal 4), ☎ +63 2 851-0667, e-mail: rogersplacehotel@achieversgroup.com.ph. The closest hotel to Terminal 4, it has economy rooms, standard rooms and two family rooms for large groups. Free breakfast. ₱2000. All six hotels around the airport perimeter have free shuttle service to bring guests to and from all four NAIA terminals. There are also other hotels in Pasay and Parañaque that are further away from the airport complex, but are still close, mostly in the area around SM Mall of Asia and Entertainment City Manila, the intersection of EDSA and Taft Avenue, and along Roxas Boulevard. Philippine Air Force Aerospace Museum, Andrews Avenue cor. Sales Road, Pasay (Beside Terminal 3, opposite the Maligayang Pagdating Rotonda), ☎ +63 2 854-6729. M-F 08:00-17:00, Sa 08:00-12:00. Founded in 1974 as the Marcos Museum, today it's a modern museum showing the history of the Philippine Air Force and Philippine military aviation, as well as general aerospace science. A collection of historic PAF aircraft is on display outside the museum in the Aircraft Park, including the now-retired F-5. ₱20. Villamor Golf Club (On the southbound exit of the Nichols Interchange), ☎ +63 2 853-4977, +63 2 853-4988. Host to the Philippine Masters several times, it is a relatively flat course, but still challenging because of the trees, the terrain and the occasional strong wind. Some golfers claim it to be the best course in Metro Manila. ₱935/₱1375 for locals, ₱1375/₱2145 for tourists (weekday/weekend). Across from Villamor Airbase and opposite Terminal 3 is Newport City, a mixed-use development built on land that used to belong to the base. While a significant part of the development is residential, it is better known as the home of Resorts World Manila, the Philippines' first casino-resort. Aside from a casino, Resorts World Manila also has a mall, a cinema, a performing arts theater and a popular nightclub. In addition to Villamor Airbase and Newport City, a number of other areas are also close to the airport. These include Bay City in Pasay (home of the SM Mall of Asia) and Entertainment City Manila in Parañaque, built on land reclaimed from Manila Bay. Makati is also a reasonable distance from the airport, as are Taguig and the southern half of Manila, including Intramuros. This huge airport travel guide to Ninoy Aquino International Airport has guide status. It has a variety of good, quality information including flights, ground transport, restaurants, arrival and departure info. Please contribute and help us make it a star!